Stikhotvoreniya Stikhotvoreniia 1, 2, 3. 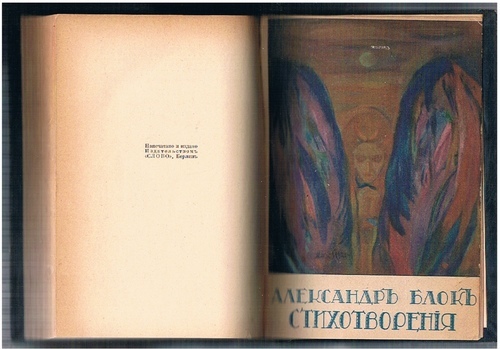 First complete edition. Kniga 1916). Three volumes complete. Contemporary blue morocco with original card wrapper bound into the back of volume one. Raised bands to gilt lettered spine. Card covers colour reproduction by Nikolai Millioti. I: Portrait frontis. photo of Blok as a young man. II: Facsimile of 'Neznakomka' as frontis., III No frontis. as published. Set very tight and clean but small stain to volume one leading corner and leather a little marked or stained in places but quite unobtrusive, edges just a little rubbed. ; Poems from 1898 - 1916. Revised and augmented the following year .